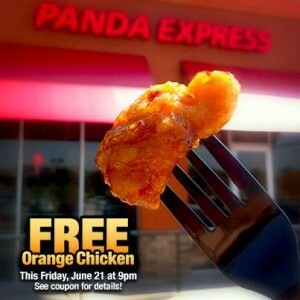 Head to the Panda Express Facebook page to grab your coupon good for FREE Orange Chicken on Friday, June 21! This FREE food offer is only valid from 9pm-close. No purchase necessary. While supplies last. One FREE coupon per person per day. Not valid with any other coupons, discounts or promotions. Valid only in-store at participating locations.